By John Sheehan on August 01, 2013 . It's no secret that we've been inspired by a myriad of open source community projects that exist to solve some of the same problems we're after. 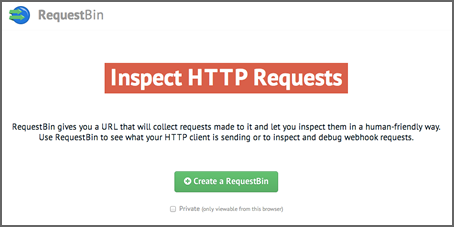 King among those projects is RequestBin, Jeff Lindsay's HTTP inspector project for testing HTTP clients and debugging webhooks. Today we're thrilled to announce that we've reached an agreement with Jeff to take over the RequestBin project and publicly-hosted instance available at requestb.in. It is very important to us that the service stay free and open to the developer community indefinitely. The GitHub project will be moving organizations, but we're not making any changes to the license and will continue to publish changes, fix issues and actively maintain the project going forward. We also will continue to offer the hosted version without any registration requirements. Just keep using it the way you always have been. While we may add Runscope-specific features and integrations in the future, they'll always be optional. In concert with today's announcement, we've shipped a refreshed visual design and cleaned up the code to make it even easier for you to self-host your own private instance. Your feedback and contributions will help us keep the project moving forward, so make your voice heard if there are features and ideas you'd like to discuss. To top it all off, we're thrilled to have Jeff joining Runscope's Advisory Board. Jeff has a keen sense for what developers will be working on next. He lead the way on webhooks and is breaking new ground again with Flynn. We couldn't be happier to have him on board. RequestBin joins our roster of community projects that includes API Changelog, API Digest and API Jobs. If you're new to Runscope, be sure to check out our set of free API debugging and testing tools by signing up for a free account or checking out the Developer Guide.